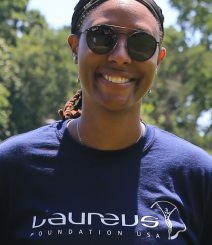 Chamique Holdsclaw is a three-time NCAA Champion, six-time WNBA All-Star, and Olympic Gold medalist. Holdsclaw played for the University of Tennessee, and is the all-time leading scoring and rebounder in SEC women’s history. In 2000, she was named Naismith’s Player of the Century for the 1990s and was part of an ESPY award given to the Lady Vols as Co-Team of the Decade for the 1990s. In 1996, 1997 and 1998, Chamique was named to the Final Four All-Tournament team.